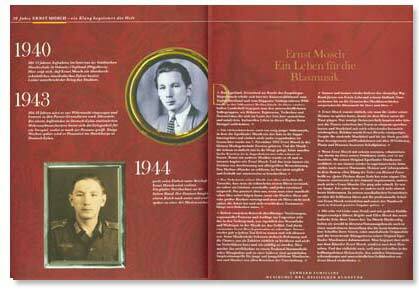 It was in the small village of Zwodau near Falkenau where Ernst Mosch was born on November 7th, 1925. In accordance with an Egerland's tradition to raise at least one musician in each family he performed the flute in his school's orchestra when he was only eight years old. Soon thereafter he became a member of Hans Dotzauer's well known Youth Wind Band. When he was fourteen he attended the Urban School of Music located in Oelsnitz, Vogtland, to study violin, flugelhorn, and trombone with excellent success. This, along with his enormous musicality, was to stand him in good stead for his future profession. However, he met a similar fate like a whole Bohemian generation: Forced labour, army service, being wounded with only nineteen, and after all being expelled from his beloved homeland. By playing his trombone in American music clubs in West-Germany he managed to overcome post-war difficulties. 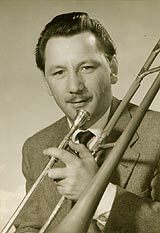 After some engagements with the Hamburg Radio Dance Orchestra he became 1st trombonist in Erwin Lehn's Sudfunk Dance Orchestra, Stuttgart, in 1951. At that time hot rhythms and jazz syncopation were en vogue. But soon enough Ernst Mosch, a deep Bohemian musician, was longing for what he called a "true polka from home". Some like-minded friends were close at hand, he handed out the scores, and with joy and passion they played the music of their lost homeland - not knowing they were at the very beginning of a great career. 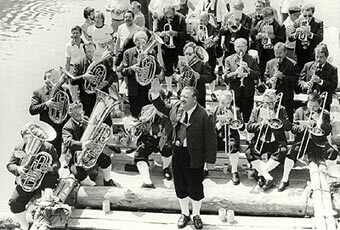 The birth of the "Original Egerlander Musikanten" was on April 21st, 1956. For the "Sudfunk Stuttgart" radio show Ernst Mosch and eighteen musicians recorded some famous brass-titles such as "Rauschende Birken", "Mein Egerland", "Abendlauten" and "Fuchsgraben Polka". This first radio show became a big success. The peoples' interest for "original" Bohemian polkas, waltzes, and marches was immense. Soon the first single "Rauschende Birken" was released and caused a sensation in 1960: It had been sold more than a million times and earned a Gold Record, recognition which is normally reserved to pop artists. But more than 40 years of success were about to follow, with uncounted awards, mammoth-tours to Europe and around the globe, and an audience which enthusiastically loves the most famous brass-band of the world. 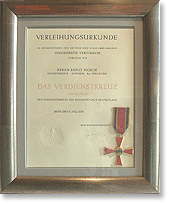 In 1981 Federal President Walter Scheel decorated Ernst Mosch with The Order of Merit of the Federal Republic of Germany. The award was presented by Regional Commissioner Helmut Haun. After the ceremony guests enjoyed a raft trip upon river Isar, Munich, Germany. 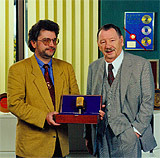 1981 Conferment of the "Hermann-Loens-Gold Medal"
1995: Two Gold and one Platinum Disc for 750,000 sold copies of "Ein Klang begeistert die Welt"
Conferment of "The Golden Microphone"